Latin America has one of the highest rates of urbanization in the world (80% urban population). By 2050, 90% of Latin America’s population will live in urban areas. This high rate of urbanization coupled with the global economic crisis has resulted in a waste management crisis. Municipalities find themselves unable to keep up with providing services and infrastructure to the urban populations. Some cities in Latin America are facing this challenge by integrating the informal sector recyclers who are already active in their cities into the municipal solid waste management systems. In many cities, these “recicladores”, “cartoneros” or “catadores” (a few of the many names used for these workers in the region) are responsible for up to 90% of the recyclable waste recovered from the waste stream. Their work reduces municipal waste transportation costs, increases landfill lifetimes and supports the recycling chain throughout the region. Every location presents its own challenges–there is no one-size-fits-all solution for integrated solid waste management systems–but relevant lessons can be drawn from both failed attempts and successful examples of informal sector integration in recycling systems in Latin America. There are often two very different contexts within cities. In low-income neighborhoods waste collection services are often not provided and individuals and families accumulate and then sell their recyclables for additional income. In contrast, residents in high income neighborhoods do receive a waste collection service and their motivation for recycling is often related to greater levels of environmental awareness. It is important to consider these differences when designing waste management solutions. Imported systems, and even locally derived systems based on examples from the Global North, generally focus on only one waste management scenario, making it difficult to manage the multiple competing scenarios in many cities in Latin America. There is often a bias towards the automation of waste management services, with the application of the high technology solutions used in the Global North. Regardless of the practicality or scientific evidence against certain high tech solutions, these are often sought after, thought to raise the bar of the city, to make it appear more sophisticated and modern. This leads to a misconception that working with informal sector is a step backwards in terms of urban development and modernization. Conflicts between private waste management companies, the municipality and informal recyclers are common. The waste management companies do not want pickers on the landfill and wastepickers then go to the municipality for help. However, municipalities usually have very little experience to support the integration of formal and informal waste sectors. There are opportunities for new systems to emerge within this conflict. For example, during a similar conflict in Mexicali, Mundo Sustentable, with the help of Danone, intervened to help a private company work with the informal waste sector and improve recycling rates. In Latin America, there is a great opportunity to increase recycling rates by using labour-intensive solutions, which create jobs and support the development of a better urban environment in the cities. Municipal governments should be an integral part of these processes as they are usually responsible for solid waste management at local level. The key to catalyzing informal recycling sector integration will be the development and dissemination of successful examples. Informal recyclers provide important a range of services to municipalities (such as waste collection and recovery in communities that would not otherwise have access to them), as well as cost savings (for example, the extension of landfill life and reduced transport costs), yet are rarely compensated for these benefits. Informal recyclers further form the foundation of an entire recycling supply chain, which ultimately benefits formal businesses, and often aliment entire local economies. Municipal governments are often hesitant to work with informal actors, who are frequently seen as an unknown quantity. Yet often in the process of working and developing relations with informal recycler groups, their concerns diminish and they may actually exhibit enthusiasm. Likewise, the recyclers may gain in confidence and professionalism in their experience of formalization. One major challenge facing efforts to integrate the informal sector in developing countries is the desire of some local governments to adopt technological solutions that appear more “modern.” In much of Latin America, however, low-cost, low-tech solutions tend to be more viable and sustainable. The main difference between Latin America and the countries of the Global North is that solid waste management is a labor intensive system. It is made up of workers and hence has an important social component. 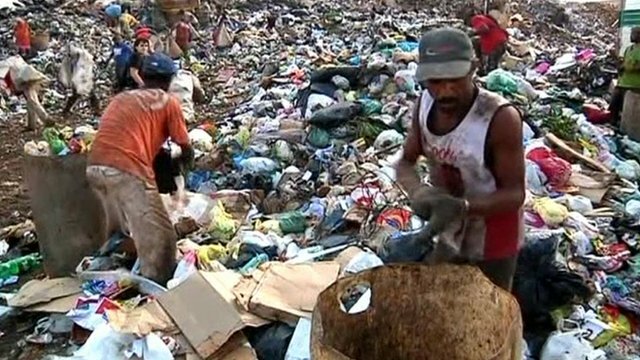 The ILO estimated there is 24 million of people working in the global recycling supply chain, but those at the bottom of the pyramid, the wastepickers, make up 80%. They remain the lowest paid even though they make an enormous contribution to their cities. It is important to understand that highly sophisticated, high technology systems are not required for effective resource recovery. In many cities in Latin America between 80-90% of everything that is recycled is recovered by the informal recycling sector. Despite the fact that there is little or no public investment in waste management or recycling infrastructure, cities with an active informal sector reach twice the rate of fully formalized municipal solid waste management systems. As an example, the recycling rate is 60% in Cairo, while in Rotterdam (and other cities in the Global North) recycling levels only reach 30%, even with a high public investment in the system (UN Habitat, 2010). When designing infrastructure and waste management systems we must consider not only the waste management and resource recovery needs but also the social side of the system. In order to be effective, efforts to upgrade waste management services should go hand in hand with efforts to formalise and integrate the informal sector. An example of a recent success story is that after 27 years of struggle, the waste pickers in Bogota, Colombia have managed to change the government’s outlook on their work and their existence. They are now included in the system and are paid per tonne of waste collected, just like any other private sector collection and waste management company would be. They have become recognized as public service providers, acknowledged for their contribution to the environment and public health of the city. The key challenge is to be much more creative and understand that in order to improve the working conditions of waste pickers and in order to increase recycling rates, we don’t need high technology. We need a systemic approach and this can be very simple sometimes infrastructure as simple as a roof [on a sorting area] can be effective in improving working conditions. Be Waste Wise is a global platform for content and conversations on waste. Its mission is to bridge the waste solutions expertise dissemination gap worldwide by using 21st century tools, opening up high-quality, leading-edge thinking to those who have not had access to this expertise, while also eliminating the environmental and financial costs of global conferences. Tagged Bogota, garbage, Informal Recycling, Latin America, Recycling, Recycling Sector in Latin America, Solid Waste Management, solid wastes, Trash, Waste Management, Waste Management in Latin America, Wastes. Bookmark the permalink. energy for the municipalities, industries, and other entities within the country’s regions. Along with the technologies, a major emphasis ha been on the utilization of waste handlers in our projects in a more sanitary atmosphere and also to allow ownership in our projects, that also includes a percentage of recyclable portions. With this methodology we also create a better incentive for collection, abate the simple dumping of wastes: and thus create a much better environmental condition and also sustain a region’s communities with lower cost energy. Many developing countries have the same agricultural wastes that have not been utilized for energy or other products because of the moisture content, We have developed a machine that reduces moisture contents from to 86 percent to a usable form of 10 to 40 percent. In most cases, this is enough of a reduction to make a fuel source to completely process many agricultural products. Of course, we are certainly happy to work with any agency or group to assist them and their communities.